You probably know that you have to impress a hiring manager with your resume fast. Approximately six seconds is all the time you have to grab their attention before you are selected to move to the “interview” pile (or not). A well-written resume isn’t enough anymore – a visual appeal is what compels recruiters to take a second or longer look. This is due, in part, to the readily available design software systems and expanding trend of creativity. People (workers) are starting to think outside the box by redefining not necessarily the content of a resume, but how it is displayed and presented. 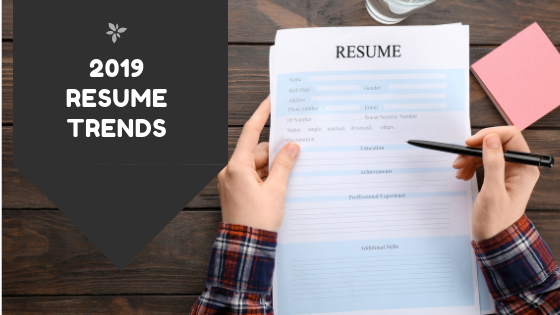 This year, take some time to review and update your resume so that it includes white space, graphics and other representations of your accomplishments that don’t just say you are the best candidate for a job, but that literally illustrate it too. The following are some tips to consider in redesigning your resume. You don’t need to fill every inch of your resume with something; sometimes less is more. This year, leaving open white space on your resume is a popular theme. Oftentimes we think of building a resume as the only opportunity we will have to convey all of the details about ourselves and our past work experience. Even though it is recommended that you still need to have valuable content on your resume, leave space so that hiring managers can easily navigate through your work and education. Sometimes white space is as catching to the eye as a colorful graphic. This is also a good opportunity to highlight your experience, but save some details for what would hopefully be an interview. You’ve probably heard this one before, but: don’t just list out your job responsibilities and the tasks that you needed to complete. Use your resume as space to highlight your accomplishments, like sales growth and success rates. Being able to use metrics to showcase your successes is another big trend for 2019. Quantifying the results of your experience allows you to tell the story of your career with tangible items that hiring managers can relate to their own business. Infographics are a forward-thinking trend that you could consider including on your resume, contingent upon the type of job you are applying for. You can use free tools like Canva to design your resume to represent your best traits, skills, and accomplishments in a fun, graphical way. Using graphics to highlight awards, or represent metrics and growth you’ve achieved can not only create a helpful visual for your hiring team but can also illustrate creativity. You can even make it look more like an infographic if it appropriately represents your skills in a positive manner. It can be a fun way to show what you have done and use that valuable six seconds to get attention and make them want to read more. Even though you can make a resume more engaging and aesthetically pleasing by using color, design, and infographics, it should still, first and foremost, remain professional. Your resume should include relevant information, like your past experience and education, in a clear, well-articulated way. Even with graphics and fun elements, it should be easily read and scanned. Try to be as intentional as possible when it comes to design and be courteous to the reader in terms of “business” on a page. Include social and digital media. If you have a LinkedIn profile or a personal website where you put information about your experience or write a blog about your industry, include the URLs on your resume so hiring managers can learn more! It is a digital era and what good are these tools if we don’t leverage them? For example, resumes use to require (or it was at least advised) that you provide your physical address. Nowadays, it is more beneficial to include links to your online presence — particularly if it is indicative of your work, network and skill set. Let’s face it, prospective employers are probably going to Google you anyway, so make it easier for them to find the information you want them to see!